If you have ever walked the streets of Tokyo you will understand why Japan is the land of the loyalty club. At station hubs there are many stores and supermarkets. Not to mention the number of small stores scattered across what seem to be back lanes. And the army of vending machines that keep watch over the streets. With so many places to spend your money there must be a way to retain customers. 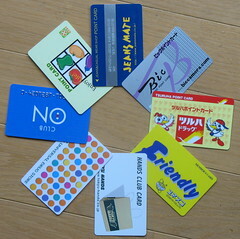 And that way is the Points Card, or “ポイントカード”. If you submit to the sign up procedure, and remember to show your card before purchases, you accumulate points based on the amount you purchase. On accumulating enough points (and making many purchases) you receive a reward determined by the store. It seems that almost every store you go into has a Point Card of some sort. Be it a plastic card with a bar code or a magnetic strip, a paper card that you get stamps on or apply stickers to, or some sort of fancy RFID card (Keferl, 2008). They are all a way to seek your continued patronage of the store. Every store, that is, except the ones you seem to use the most – convenience stores. Of the different convenience stores I frequent I have not seen any advertising for Point Cards. I suppose that convenience stores are the life blood of a 24 hour Japan. Everyone needs to use them, so no need to offer further incentives. 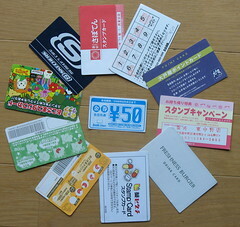 However, in an article dated 17 December 2007, it seems that Japan’s main convenience store chains are all considering introducing Points Cards, citing an increase in competition (Betros, C. 2007). Perhaps 24 hours of magazines, mixed drinks and instant noodles is just not convenient enough anymore. Whenever I shop, every teller operator asks for your ポイントカード as a matter of course. Take goods, ask for Point Card, take money from tray. Many will even tell you where you can register for one. And send you off with your receipt. Unfortunately this often involves filling out a form in Japanese, for an employee that does not have the best level of English, and making sure you do it while the correct people are there to sign you up. While I understand that they are aimed as Japanese and that I am a visitor, it sometimes gets you down having all these forms to fill out that you do not understand. Or be able to read the fine print. Not to mention finding out that you actually get with your points. Another problem with not being able to read all the Japanese text, is the signs with large, detailed photographs of all the types of Points Cards you cannot use in the store, for instance Tokyu department store above Shibuya station. In Australia, signs showing what you cannot do generally have a clear red cross through the pictures of forbidden activities. A Japanese teacher mentioned to me that the current explosion of Point Cards is due to the introduction of goods and services taxes – that stores are trying to give back to customers what the government is taking away from them. For all the ubiquitousness of Point Cards I have noticed a few options available in Australia that I cannot find here. Having got a Point Card at Tokyo Hands to collect points I though it would be useful if both my wife and myself had linked cards, i.e. 2 individual plastic cards that feed into the same pool of points. This does not appear to be available. Tokyu Hands said we could swap the card and both use the same card, but they seemed to have no system for giving each of us a card so that we do not always have to remember to swap cards. Tokyo Hands was happy for each of us to belong to their Points Card scheme as individuals, but not as a family. I suppose that this may stem from a stereotype in Japan that only the wife does shopping, so only she needs the Points Cards. Talking about this with my Professor, I found that he does not carry any Points Cards, his wife keeps them all. It was interesting to find that all the parts of an octopus-style corporation have their own Points Cards, e.g. one for Tokyu Tops, one for Tokyu Hands, and I presume one for the Tokyu department store. Why not tie them all together and have one Points Card for all of them? I wonder if in Japan having one card for a group of stores would result in too many points being awarded? Or if octopus-style corporations would rather tie customers to all their stores individually? Or to avoid a messy demerger like that of the Coles Myer group? Probably a combination of the three. So it seems that as long as I stay in Japan, I will be filling out Points Card application forms in each different store I use and swapping cards with my wife. Maybe one day I will even accumulate enough points to find out what my reward is … or perhaps I will return to Australia, never having spent enough. This entry was posted in Shopping, Social, Travel and tagged Japan, loyalty clubs, point cards, Tokyo. Bookmark the permalink.